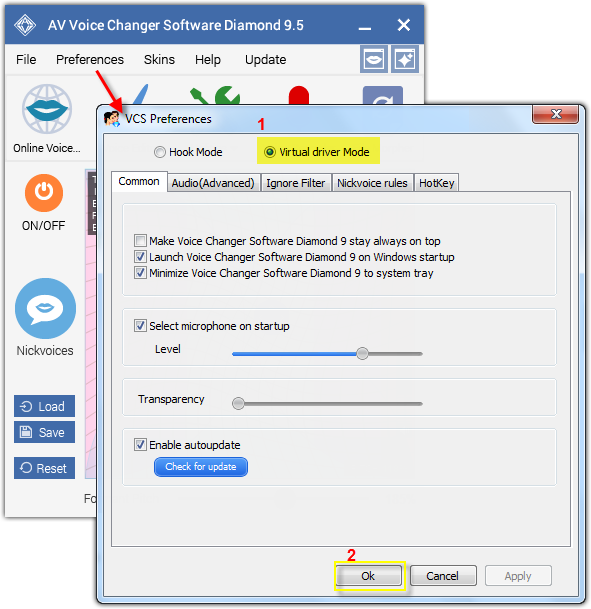 This tutorial will guide you through the way to set up AV Voice Changer Software Diamond 9.5 (VCSD 9.5) to change your voice in Yahoo Messenger 11. Yahoo Messenger was shut down on July 17th 2018. Now it's time to say goodbye to this 20-year-old chat client and give chance to other modern alternatives. » See how to connect VCSD 9.5 with Skype here. » See how to connect VCSD 9.5 with Google Hangouts here. » See how to connect VCSD 9.5 with Discord here. » See how to connect VCSD 9.5 with Twitch here. To connect Voice Changer Software Diamond with another VoIP application: Change the program’s microphone input to VAD. » Details in Step 2 below. - Click Messenger (1)>> Preferences (2) or (Ctrl +Shift+P) to open Preferences dialog box. - In the Yahoo! Messenger Preferences dialog box, choose Video & Voice (3). - In the Microphone section, choose Microphone (Avsoft Virtual Audio Device) for your microphone (4). 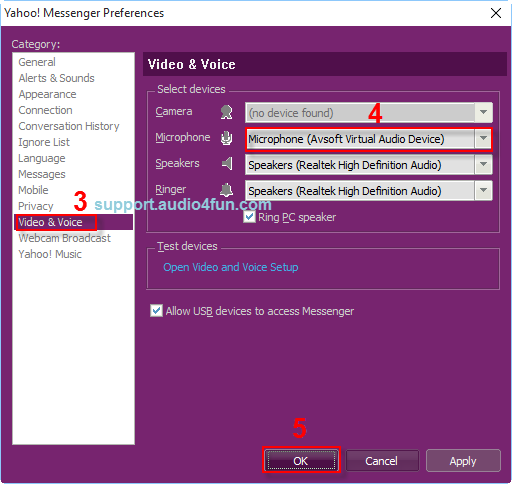 Note: While VCSD 9.5's Virtual Audio Driver is being set as the audio driver for Yahoo Messenger, do NOT turn off VCSD 9.5 when doing voice chat. If you don’t want to use VCSD 9.5, change the audio settings of Y!M11 back to normal audio source.